Veta have been organising some good parties at Module, with the last one being Dasha Rush in December. 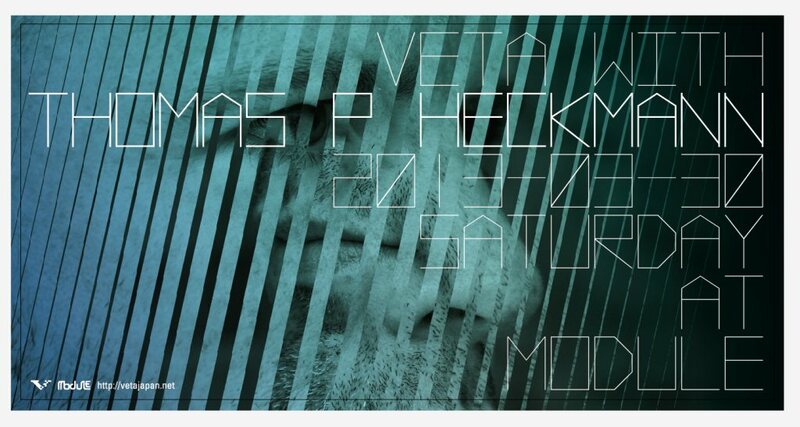 This Saturday 30 March they are back, with Thomas P. Heckmann as their guest. He’ll be doing a live and DJ set. It’s a bit of an interesting choice – Heckmann was obviously a very pivotal figure back in the ’90s, but has been less prominent in recent years, even though A.F.U. appears to be still going strong. I’ve only seen him once, at a rave in Melbourne in 2002. I really liked him back then, and I am very curious to hear how he will sound now… I’ll also be DJing in the lounge, and I’m planning on playing some warm synth sounds, similar to what I’ve been pointing to in my last few posts. I’ll be playing from 3:30 – 4:30. For more info, check the Veta event page.